Across the broad spectrum of fluids handling in the processing industries one element that is common to all is the requirement for positive displacement pumps that can move delicate or sensitive media without causing damage to or physically altering the structure of the media. The food and beverage manufacturing industry is considered to have the biggest requirement for such pumps as many applications require a gentle pumping action. Typical applications include fluids that contain solids, display either high or low levels of viscosity, have high or low temperature levels, are non-lubricating or could be made from ingredients that can be aggressive and cause damage to the pump. Within food processing the pump technologies that have a very high profile are rotary piston, rotary lobe, twin-screw, air-operated double diaphragm pumps. Clearly, there is no shortage of pump types from which to choose, which makes matching the pump to the application the prime consideration. 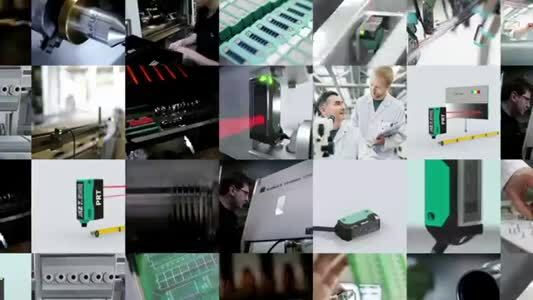 Although there is still no legal obligation on food manufacturers to use hygienically certified fluid handling equipment, the ever-increasing costs financially and in the potential harm to a brand’s reputation resulting from hygienically defective products, has meant that never before has there been so much pressure on food manufacturers to utilise the correct hygienic process equipment in the sight of the law. There are two basic groups of approval, those that apply to material compatibility and those to the actual design of the pump. Taking those concerning material compatibility, there are several globally recognised approval bodies the oldest being the US Food and Drug Administration (FDA) which is still seen worldwide as the basic benchmark for material compatibility. However, there is a new kid on block in the guise of EC 1935/2004. The pumps that can accommodate many applications in food processing are rotary lobe and external circumference piston (ECP) pumps because their large rotor cavities can handle the solids and particles that can be present in the fluid being pumped. There is very little difference between a rotary lobe and an ECP pump as they both essentially use the same operating principle. 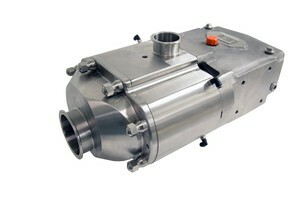 Waukesha Universal series of rotary lobe and ECP pumps has proved to be successful across the globe. The WCB Universal 1 and Universal 2 (Fig.1) pumps deliver many of the sector’s fluid handling requirements over many years and only quite recently the series has been extended with the introduction of the Universal 3 (Fig.2). Complementing the long-established Universal 1 and Universal 2 pumps, the Universal 3 delivers both the high levels of hygienic design and precise pumping characteristics of the Universal 2 and an improved choice of seal types . The Universal 3 design is compatible with SIP/CIP requirements, offers the same low levels of product slippage and heat build-up within the pump chamber as the Universal 2 but, with the option of lip seals as favoured by many within the confectionary industry when handling chocolate. In addition the Universal 3 has had its seal area redesigned so that all seals are front loaded and are now accessed from the product side making maintenance much easier. The main features are the complete SIP/CIP capabilities and double O-ring seals, which are not available in the Universal 2 and Universal 1 Series. Available with stainless steel gear cases as standard, the Universal 3 can accommodate pressures between 20.7bar and 34.5bar and temperatures up to 149C. The pump can dry run is a suitable for handling food grade fat applications without there being a need to mix the product with water. Capable of delivering flows between 2.5m³/hr and 450m³/hr, the Universal 3 delivers maximum service under the most demanding operating conditions. For one international producer of ice cream mix, problems were being experienced with premature failure of rotors and shaft parts in pumps in its ice cream mixing system. The pumps used in this system were being replaced every six months so it was also looking to reduce the cost of ownership. The problem was solved by installing a new mixing system fitted with WCB Universal 1 ECP pumps. The rotors were able to stand up to the plant’s demanding performance requirements and eliminate pump downtime. Also the simple ‘O’ring shaft seals were an alternative to the more expensive and sensitive mechanical seals supplied with the original pumps. In another dairy plant producing white mass for Greek yoghurt, the producer was experiencing multiple issues with its existing lobe pumps, in particular excessive shearing when pumping the mix and high maintenance costs resulting from pump break-downs. Over several years the producer evaluated various pumps to determine which type imparted the least amount of damage to the white mass, provided the best cleanability and offered the lowest costs of ownership. 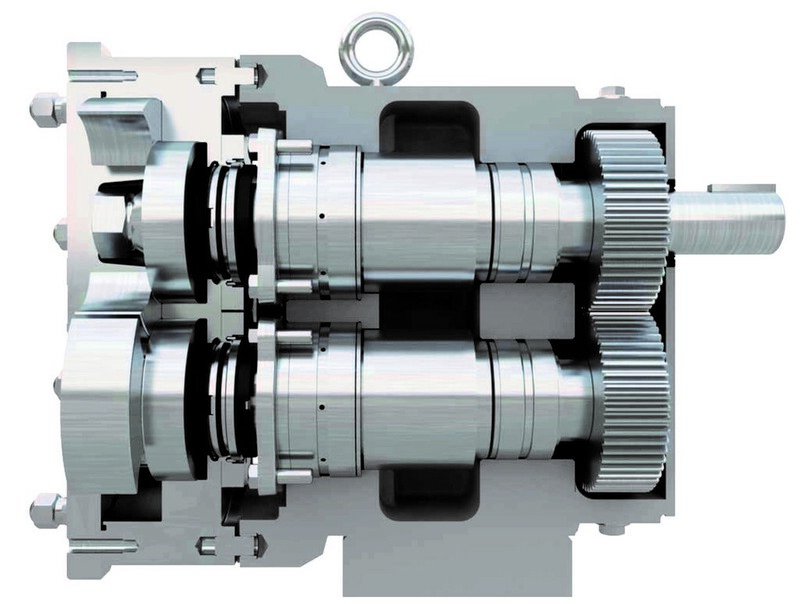 At the end of the trials the WCB Universal 2 pumps with single mechanical seals were selected for the application. Using the WCB pumps have proved to be durable and maintain the integrity of the producer’s product. 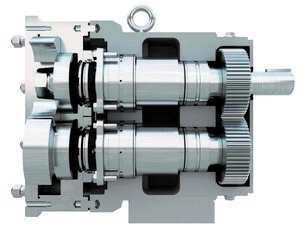 A further recent addition to the WCB Universal Series is the Universal TS pump (Fig.3). This exploits the benefits of twin screws to pump various media containing large particulates, thereby lowering damage to the pump and reducing maintenance. Users also benefit from the pump’s high suction capability and wide range of operating speeds which means that only one pump is required to transfer product and undertake CIP. This removes the number of pumps, valves and control instrumentation, thus contributing to reduced costs and simpler, more compact systems. 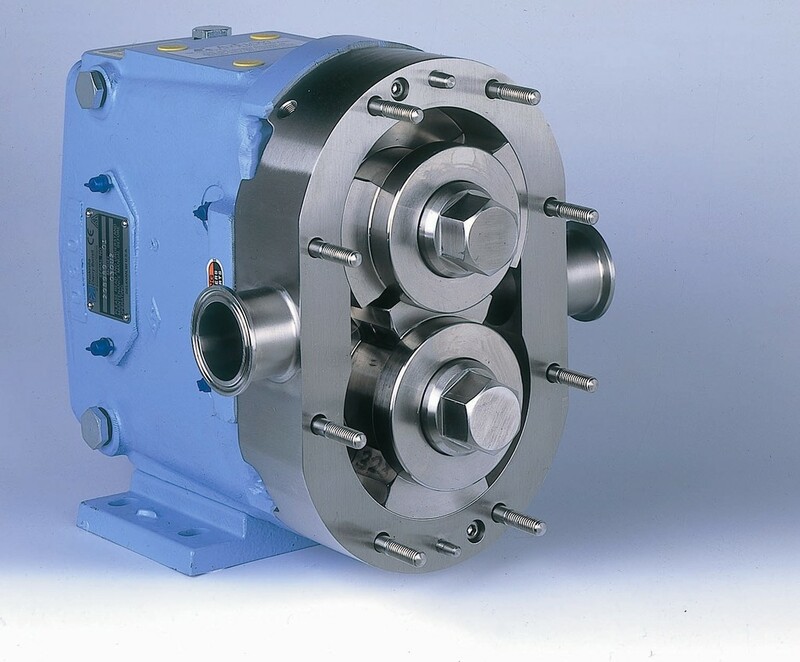 As a result of the twin screws’ rotating geometry, a pulse-free flow is created making the pump suitable for many applications such as feeding homogenisers. Significantly, the meshing screws have identical rear and front profiles giving bi-directional flows which enable easy media transfer between vessels without alteration to the pump set-up. Front loaded access to product side seals makes for easy maintenance and reduced downtime.